Check if you're eligible for a Matched card without affecting your credit score. Provided by Bank of Ireland UK. Post Office Limited is a credit broker and not a lender. *You'll need to transfer the balances within three months of your account opening. You may receive an APR of 23.9% depending on your individual circumstances. 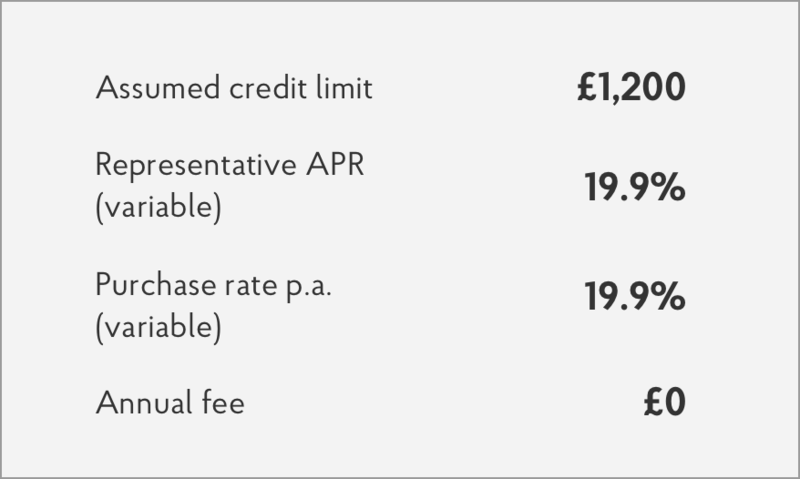 To keep these rates, make sure you stay within your agreed credit limit and make your minimum payment on time every month. Read these before you apply: Matched Credit Card Summary Box , Terms and Conditions, Bank Of Ireland UK and Post Office privacy notices. Bank of Ireland UK adheres to the Standards of Lending Practice which are monitored and enforced by the Lending Standards Board. Please read the Statement of Lender and Borrower Responsibilities which sets out our key responsibilities. Along with 0% on purchases and 0% on balance transfers for your first 8 months, you’ll enjoy a host of other great benefits. Tap and pay with contactless – it makes low-value transactions quick and easy. Manage your account easily with our mobile app, online servicing on the phone. Use it worldwide – MasterCard is accepted in over 35 million places. No fee for Travel Money – when you pay with your card in a Post Office branch or online. Stay secure – MasterCard® SecureCode™ helps prevent online fraud. It’s easy to make payments, set up Direct Debits and track your spending – any time of the day, wherever you are in the world. Use online servicing for complete control of your account information and settings from a laptop or desktop. Our mobile app lets you check your balance, make a payment and set up or change Direct Debits on the go using your smartphone or tablet. Manage your Post Office ® Credit Card online or get the mobile app. If you need to tell us that your card has been lost, stolen or likely to be misused, then you should call us on 0800 169 2646 or +44 800 169 2646 if abroad. If we need to contact you about potential fraud on your account, we will do this via a secure channel including, but not limited to, SMS or Email. To help you manage your Credit Card, from time to time we will send you free alerts about your account. If you would like not to receive these alerts in the future please contact us. You may request a copy of your Agreement at any time while your account remains open. Here's a summary of the interest and fees, when they apply and how you can avoid extra charges. When your 0% period ends any outstanding balance will be charged at your standard variable rate. New purchases will be charged at the standard variable APR. It's a way of showing what your borrowing will cost over the year, including interest and fees. You can use it to compare products from different providers. 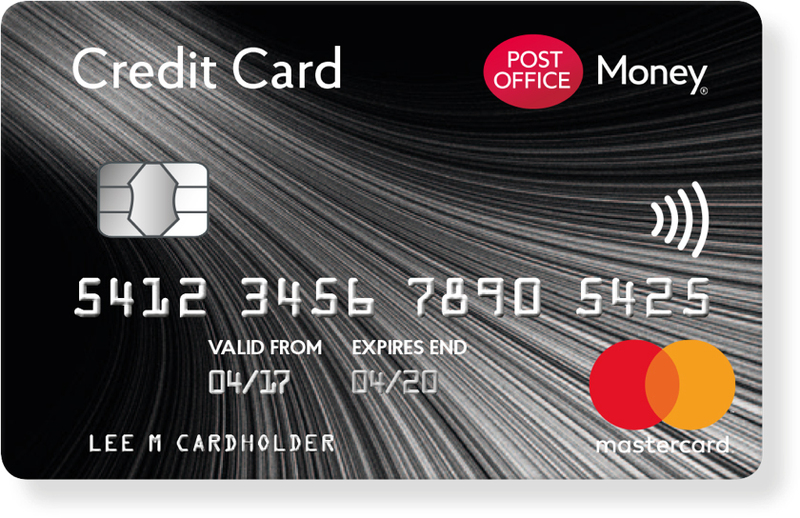 The example we've given above shows the APR (19.9%) and credit limit (£1,200) you might typically get on our Matched Card. But it’s just for illustration. We'll base your actual APR and credit limit on factors like your circumstances, credit score and ability to pay back what you've borrowed. What fees do we apply? We try to keep fees to a minimum but sometimes we do need to charge them. Credit cards can be a convenient way to borrow money in the short term. If you’ll use yours to pay for goods or services, look for a card with a long period of 0% interest that helps manage the cost. Need a different credit card? Transfer your store and credit card payments for up to 25 months. The smarter way to spend at home and abroad- up to 8 months on purchases and no overseas transaction fees. Representative APR (variable) 18.9%. Post Office Limited is registered in England and Wales. Registered Number. 2154540. Registered Office: Finsbury Dials, 20 Finsbury Street, London, EC2Y 9AQ. Post. Our FCA Register Number is 409080. You can confirm our registration on the FCA's website (www.fca.org.uk). A credit card is designed to provide short term credit. As such it is not suitable for long-term borrowing as it would be an expensive source of such credit. Yes. A credit check will be completed to ensure that the Post Office Credit Card you’ve applied for is right for you. This search will be recorded by the agency we use and may impact your ability to get credit in the short term. Contact us on 0345 607 6500 straight away. What can I do if my Post Office Credit Card application is declined and I would like to appeal? If you would like to appeal our decision you may do so by calling our Customer Service Team on 0800 169 2000. You may be asked to provide additional information to support your appeal, although there is no guarantee that our original decision will be changed. If you think your card has been lost or stolen, you should tell us straight away by phoning 0800 169 2646 or +44 117 373 3865 if outside the UK. This service is available 24/7. Your PIN will be sent to you after your card. Make sure you memorise it and destroy any record of it. Never tell anyone else what your PIN is. Don’t forget you still need to sign the back of your card. You can also view your PIN online after you register for online servicing. Yes. You can change your PIN at most MasterCard branded cash machines, but you'll need to know what your existing PIN is to be able to do this. If you've forgotten your PIN, you can view it online using our online servicing. Alternatively call us on 0345 607 6500 and we'll re-send it to you. You'll have 3 chances to enter your PIN correctly when you're trying to pay. If you enter it incorrectly 3 times in a row your PIN will be locked and you'll need to unlock it before you can use it again. To unlock it call customer services on 0345 607 6500. If you've forgotten your PIN, they can send you a new one by post. Can I manage my account online and over the phone? Yes, there are three ways you can manage your account; through our mobile app, online and over the phone. The easiest way to make your Credit Card payments is to set-up a Direct Debit. You can set up a Direct Debit through our mobile app, your online account or by calling us on 0345 607 6500. You can also pay via our mobile app, online servicing, by post, at a Post Office branch, or if you use phone or internet banking with your Bank or Building Society. We will send you a statement every month unless there have been no transactions during that period and you do not owe anything. If you registered for papereless statement through our online servicing, you will get an email every month telling you when your statement is ready to view. If you do get into financial difficulty, it’s important that you let the Customer Service Team know as soon as possible so they can take steps to help. You can call them on 0345 607 6500. What services are available through the Post Office Credit Card mobile app? Do I need to register for Post Office Credit Card mobile app? Yes. To register for the app once you’ve downloaded it from the App Store or Google Play you’ll need to enter a few details. All you need to do is enter your Date of Birth, Postcode and Mother’s Maiden name, and also your Post Office Credit Card number and expiry date. Other than that, you only need to setup a passcode and enter an activation code and you’re done! Is my app free to use? Yes. Your mobile app is free to download and use. Charges from your mobile network may apply, so please remember this – especially when you’re abroad. Your app is protected by your passcode, which is unique to your mobile device. For an extra layer of security, as your passcode is specific to your mobile device, anytime you change or upgrade your mobile phone you will need to re-register for the app. Access to your app is protected by your passcode, so without this your account is secure. If you ever leave your phone unattended, your app will automatically time out after 2 minutes of inactivity. If you would like some added peace of mind, you can contact us on 0345 607 6500 and we can block your app on a particular mobile device. To use your app on a new device, please download it as before and complete the registration process, setting up a new passcode unique to that device – simple. All your transactions show the time and date they were last updated. Sometimes, they can take time to reach us so might not show straight away. Also, because you're using a mobile network, your data connection may occasionally be lost. Rather than cutting out, your app will continue to display the most recent data it has. So the available funds shown might not be exactly up to the minute, but if you have an available data connection your app will never be more than 30 minutes out of date. You can see how up to date the information is from the date and time at the bottom of your screen. How do I manage my account online and over the phone? Once you receive your card, you will be able to register for online servicing to access your account online. Registration is simple and won't take more than a few minutes. Details on how to register will be sent to you with your card. You can also manage your account over the phone by calling us on 0345 607 6500 or by registering for our free mobile app. When you purchase online, MasterCard SecureCode issues a receipt at the end of the checkout process. The receipt includes details of your current purchase, such as site name, purchase amount and date. You sign the receipt using your personal SecureCode password and click 'Submit' to proceed with the purchase. Without your SecureCode password, the purchase cannot take place. Please note not all transactions will require your MasterCard SecureCode. The Card Security Code (CVC2) is the last three digits that appear on the back of your card, on the signature panel. It is used as an extra security measure to make sure you are in the possession of the card when transacting online or activating the card. What do I do if I have problems during the activation process? You can contact us on our Post Office Credit Card customer service line on 0345 607 6500. We will be happy to assist you with any problems and answer any questions you may have. Can I purchase at online retailers that do not participate in the MasterCard SecureCode service? Yes. However you will not be able to use MasterCard SecureCode. To complete the purchase at such online retailers, simply follow the regular checkout process. Is there a charge when I make a purchase overseas? There are different charges depending on which Post Office Card you hold. No charge is applicable when using our Platinum Card, but our Balance Transfer and Matched Card customers will be charged a fee of 2.99%. When you use your card overseas your payment will be converted into sterling at the rate determined by Mastercard exchange rate. Is there a fee when I purchase Post Office travel money with my Post Office Credit Card? There is no fee when you use your Post Office Credit Card to purchase Post Office travel money. You can purchase Post Office travel money in a Post Office branch or online. Do I get charged a fee for cash advances? When you withdraw cash, you will be charged 2.5% of your withdrawal or £3, whichever is greater. There is also no interest free period on cash, so you will be charged interest even if the account is paid off in full. It takes just a few minutes. And you'll get an instant decision.